I'm still trying to figure out how to properly pare down my repertoire of gear for my hiking trips. Today, I'm nearly done with one major reduction in weight and bulk. Using this website as inspiration, I'm making a homemade hammock that will be less than half the bulk of and significantly less weight than my two person tent. Plus, I shouldn't need to pick up a sleeping pad, which means even less bulk than I otherwise would need. Probably less setup and takedown time, too. Just Jeff does a much better job of describing it than I can, but I basically took a few yards of nylon ripstop fabric and a few feet of small nylon cord to whip the ends. I was able to convince my mom to hem the ends (thanks Mom!) 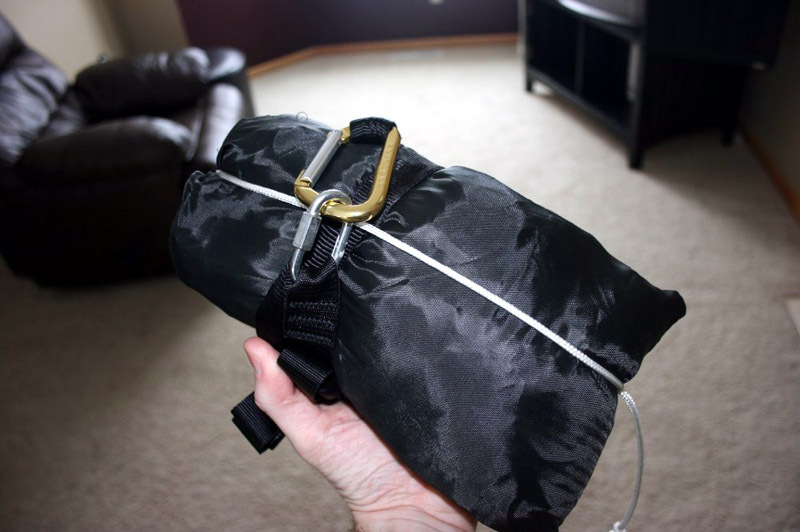 and take some scrap fabric and whip up a little bag for the hammock (thanks again, Mom! ), which is what you see in this picture. Rather fortuitously, I found a returned 'Shockles' from the Maple Grove REI at their last Scratch & Dent. It was an awesome find -- for only one dollar, I got a nice sturdy length of webbing with the ends sewn and two 600lb-weighted biners. This Shockle will act as a 'tree-hugger' -- a bit of webbing that will wrap around a tree and will connect to some nylon rope that grabs the hammock. The tree-hugger should be made of webbing as wide as reasonable so as to prevent undue pressure on the tree and to provide maximum surface area for gripping the tree (more surface area == more friction == better grip). Now that I have one tree-hugger, I only need one more and I should be good to go. I also picked up a couple steel links (somewhat biner-ish; seen in the picture attached to the gold-colored biner). These have a ridiculously awesome weight test for their size, weight and cost. If I remember correctly, each of these links is $0.89 at Fleet Farm and is rated at 600lbs test. Since I have no trees at our house (at least none that will be able to support my weight for probably 20 years), my plan is to test out the hammock at my parents' place. I'm going to try to do this while it's still cold out so I can figure out what kind of extra insulation (if any) I need on those cold-ish BWCA trips.